STOCK PHOTO: Portsmouth junior Matthew Fraulini scored a county-high 27 points Thursday night in the Trojans home win over Huntington St. Joes. STOCK PHOTO: Valley guard Bre Call had a game high 26 points in the Indians second road SOC win of the week over Waverly Thursday night. In a non-conference matchup Thursday evening, the Trojans (3-0) continued to play well, earning a 29-point win over Huntington St. Joe. Portsmouth was led by Matthew Fraulini who scored 27 points. That performance was followed up by Myguel McKinley’s 10 points and Danny Lattimore’s nine. In total, nine different Trojans scored. Huntington St. Joe: 14 FG, 6 3pt., 9-15 FT. Scoring: Bolton 12, Adkins 7, Price 5, Sweaney 4, D. Barker 4, Hickman 3, Black 3, Eplin 3, Rice 1, B. Barker 1. Portsmouth: 30 FG, 7 3pt. (Fraudlini 5), 5-10 FT. Scoring: Fraulini 27, McKinley 10, Lattimore 9, Bowman 6, Duff 6, Shipp 6, Meadows 4, Mosley 2, Clark 2. In a Southern Ohio Conference II battle, Valley (3-1, 2-1 SOC II) handed Waverly (2-1, 2-1 SOC II) an 18-point loss on its home court. 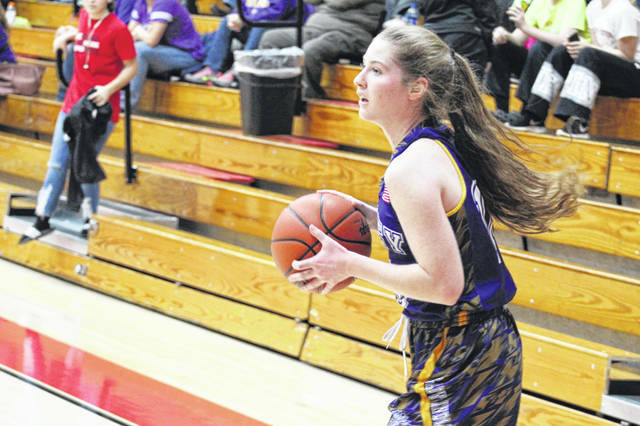 The Indians were led by Bre Call’s 26 points while Karsyn Conaway had 12 of her own. For the Tigers, Zoiee Smith had 14 points, Kami Knight had 11 and Paige Carter finished with 10. Valley: 25 FG, 5 3pt. (Call 4), 4-6 FT. Scoring: Call 26, Conaway 12, Gilliland 6, Howard 6, Buckle 5, Hettinger 2. In both teams’ second SOC II game in four days, the South Webster Jeeps (3-2, 1-2 in the SOC) pulled off a much needed conference victory over Portsmouth West (2-2, 1-2 in the SOC) on the Senators home court. Leading South Webster in scoring was freshman guard Bri Claxon with 17 points and senior Taylor Rawlins with 10 points. For Portsmouth West, senior Jordyn Swords and junior Morgan Rigsby each contributed 13 points apiece. The Wheelersburg Pirates (2-2, 2-1 in the SOC) got back on track with a home SOC II win against Northwest (2-3, 0-3 in the SOC) Thursday night after losing their road trip to Oak Hill on Monday by just one point. Leading the Pirates in scoring was guard Abbie Kallner with 19 and Kaylee Darnell with 18. Valerie Eury led Northwest in scoring with eight points on the night, all of which game from the inside the three point line. In a battle of undefeated teams in SOC I play, the Notre Dame Titans (3-0, 3-0 in the SOC) cruised to a strong defensive victory over the Symmes Valley Vikings (3-1, 2-1 in the SOC) 73-30 on their home court. Katie Dettwiller led the Titans in scoring with 19 points, while sophomore point guard Ava Hassel scord 17 herself. The Titans are back in action on Saturday where they will face the Portsmouth Trojans. 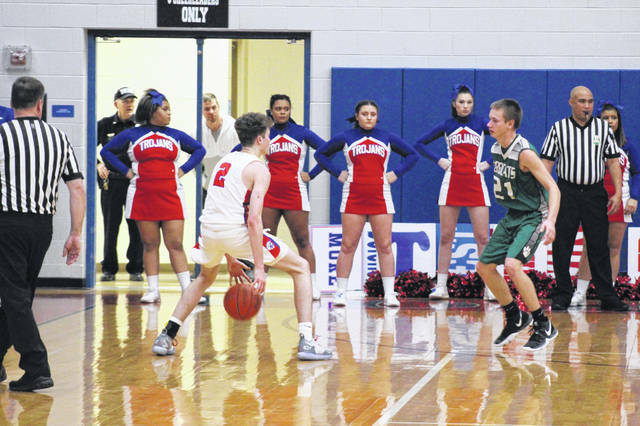 In an SOC I battle Thursday night in Franklin Furnace, the Green Bobcats (1-3, 1-2 in the SOC) got their first SOC win over the East Tartans (0-4, 1-2 in the SOC), 46-24. Freshman guard Kasey Kimbler led the Bobcats in scoring Thursday night with 13 points while sophomore Kame Sweeney also pitched in 11 points on the night. Grace Smith led the Tartans in scoring Thursday night by pitching in a tied for game high 13 points.